Remeber how I told you I look sweet in the truck. Well Check me out. It was darks out when I took this picture so I don't have my shades on. 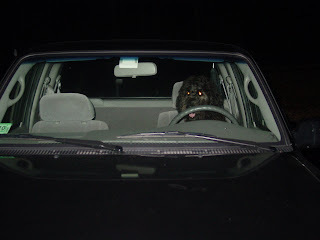 Sometimes my A lets me drive around the neighborhood but I am not supposed to drive by myself. I think it has something to do with insurance and the fact that I don't have a license. When I drive I like to aim for squirrels. Like I said I don't like those guys. They are just annoying and well I have yet to even get a simple thank you for my Nut silo idea. I mean really I am sure Eli Whitney and Louis Pasteur got thanked. I don't really even want much here I am giving away and idea that will revolutionize nut collecting and what do I get I get acorns dropped on my head. Damn Squirrels. I sure hope Santa does not like squirrels. I love your posts. The squirrel angst is not without warrant, those varmints can be irritating. I like how he is looking in the rearview mirror like he is actually backing out of the driveway.